The old adage, “No hoof, no horse,” still stands true. Without a healthy hoof, your horse’s overall health will be compromised. As caretakers of horses, it is important to know the basics skills to evaluate the health of your horse’s hooves. What many people may not realize is that improperly trimmed hooves can not only be unappealing but could potentially cause extreme pain and even lameness if left uncared for. A horse should have roughly a 50-degree angle of the front wall of the hoof to the ground. The angle of the hoof should match the angle of the dorsal surface of the pastern. If this angle, or line, is broken, it indicates a poor trim due to either too much toe, a concave break in the line, or too much heel, a convex break in the line. 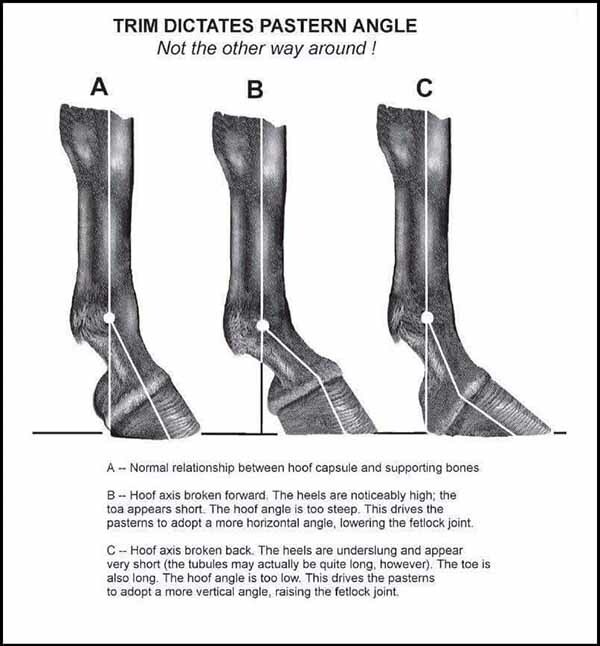 Virginia Therapeutic Farriery has a very good illustration that expands on this break of line and the impact that too much heel or toe can have on the pressure put on the pastern. Looking at some real-world examples may help better clarify how to look at your own horse’s feet and determine exactly what your farrier is doing. Here we’ll explore several horses, from close to ideal to some with imperfections. First, let’s look at a horse who has a near perfect angles (Photo 1). This horse’s hoof angle is very close to 50 degrees; this angle is closely followed with a strong pastern that matches the angle of the foot. 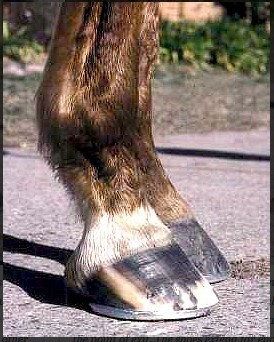 On the other hand, we have a picture of this very same hoof prior to trimming (Photo 2). In Photo 2, we see the horse has a broken back hoof-pastern angle; this will lead to increased pressure on the front of the leg coupled with an increase strain on the tendons along the back of the leg. Moving on to another horse, Photo 3, we see a horse that is overdue for its trim. 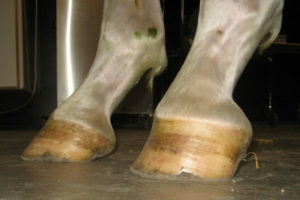 This horse also has shoes, but it is still clear to see that its toe is long and in need of trimming. Continuing to grow this foot out can result in a horse that drags its toes and may result in tripping or stumbling. A horse with this issue can develop knee and back issues from having to work harder to lift the feet to avoid tripping. This is one of many reasons why it is crucial to maintain a consistent trimming schedule with your trusted farrier. The horse in Photo 4 has a clubfoot. You can see the vast difference in the two front hooves. 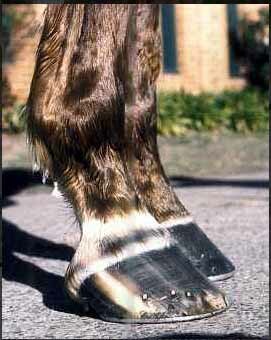 The far hoof in the photo has a near ideal shape and angle, but the near hoof would be described as a clubfoot. If not properly maintained, a clubfoot can lead to a contracted heel or tendon issues. An issue like this should not be corrected too quickly. Each time a horse’s hoof angle is changed it could potentially put strain or pressure on the surrounding tendons and ligaments, therefore any changes should be done carefully and overtime. Also, there is certainly a limit to the change that even the best farrier work can do. A farrier should work to make a horse as comfortable as possible, not to fit every horse into the same mold. Finally, we have an illustration (Photo 5) that shows us several differences in hoof and pastern angle. Horse A is the closest to ideal of the three. Horse B has heels that are noticeably high. This results in a steep hoof angle and a more sloping pastern angle. Lastly, in horse C, we see heels that are underslung and too short. 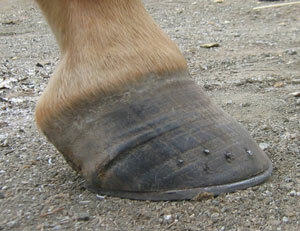 The toe is also too long, resulting in a hoof angle that is too sloped with a steep pastern. These images are not meant to diagnose your horse. They are meant to give insight to the differences in every hoof. Find a farrier that you trust, keep your regular appointments, respect their knowledge, and ask questions. Be proactive and understand your horse’s needs. Additionally, take care of your horse’s hooves between farrier appointments.